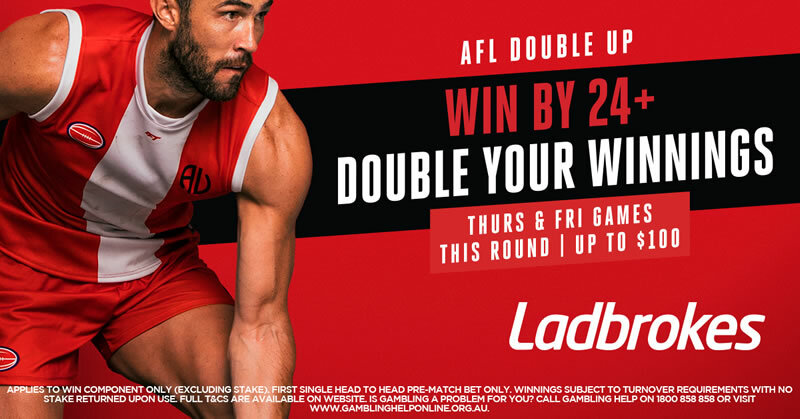 Round 4 of the 2019 AFL seasonwill come to an end on a quieter Sunday than usual, with just the two games on the card. We preview them both below and provide our expert betting tips to give you a better chance on the punt. As always, good luck to everyone following! There is a bunch of great AFL content and resources available at Before You Bet this week, so hit the links below if you want to check any of it out! Kicking off our Sunday double-header we’ve got the Suns hosting the Blues at Metricon Stadium. The Suns have surprised many this season with two wins from their first three games. They lost their opening round match to the Saints by one point but have since gone on to defeat the Dockers by three points and most recently the Bulldogs by five points. Medium-sized forward Alex Sexton has been superb with 10 goals thus far, while Brayden Fiorini (27.2 disposals) has been finding plenty of the footy. Not many expected the Blues to be featuring in the business end of the season this year, but the wayn they’ve started has been fairly disappointing. They’ve had moments in all three games that had them looking like really testing their opposition, but consistent skill error has snuffed out any such chances. They go into their Round 4 match against the Suns at 0-3 and in second last spot on the ladder. The Suns enter as 9.5-point favourites here which is fair enough when you consider their 2-1 start this season. However, they’ve had three really tough grind-it-out matches that is sure to take a toll on their young legs. On the other hand, the Blues will have marked this down as a game they have a legitimate chance of winning and will be trying their best to do so. We have the Blues keeping this one close and potentially claiming the four points. Second up on Sunday we’ve got an all Victorian affair with the Saints hosting the Hawks at Marvel Stadium. The Saints were brave against the Dockers last weekend in Perth but would eventually lose by five points in a heart-breaker. Despite the loss, they’ve still exceeded expectations early on with two wins from three games. Jade Gresham (five goals) has looked lively around the big sticks, while Jack Billings (29.3 disposals) is flourishing in his new role in the midfield. The Hawks looked like easy beats early on in their Round 3 match with the Kangaroos, however, they quickly hit their straps after quarter time to run away with an impressive 16-point win. That victory takes their record to 2-1 this season with their only blemish coming against the Bulldogs when they capitulated in the fourth quarter. Chad Wingard (three goals) made an impressive debut for the Hawks last weekend, while James Worpel (26.3 disposals) is doing his best to fill the Tom Mitchell void. It’s an interesting game we’ve got on our hands here with the Hawks coming in as two and a half goal favourites. In our opinion, if the Hawks bring their best footy early in the piece they should be too good for the Saints here, which is why we’re prepared to back them to cover the small spread.